We're on the hunt for the best brunch in Cambridge. We'll be reviewing as many places as possible to find the perfect weekend brunch. Our score will take into account the essential elements of the weekend brunch: Coffee (and other beverages); atmosphere and service; range and suitability of menu choices; the quality, size and value for money of the brunch dishes; and the all-important accompaniments and condiments on offer. So we're working through a tasty list of brunch spots in the city and we're also on the look out for new Cambridge openings offering something a little different. Follow our progress on Twitter using #CamBrunchReview. 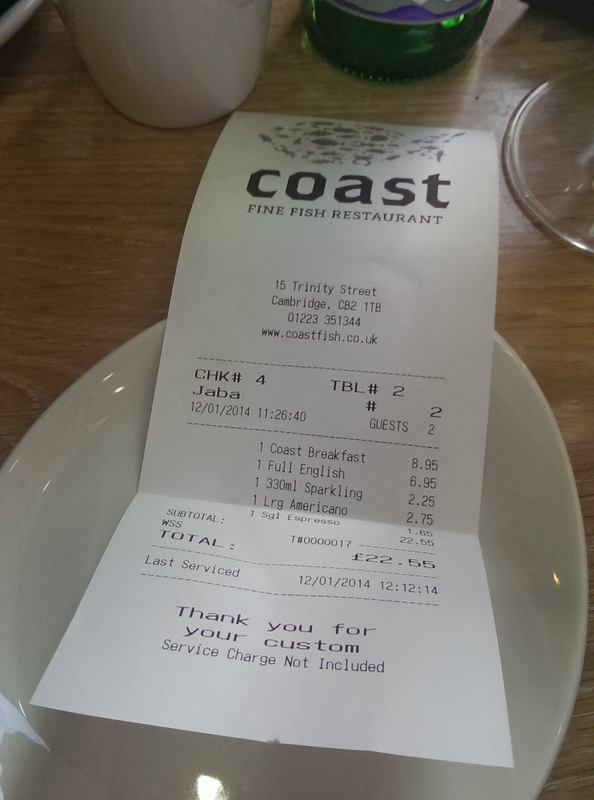 We're playing catch up again this weekend and reporting on our recent visit to Coast restaurant on Trinity Street. This independently owned fish restaurant opened towards the end of last year in a prime spot previously occupied by local cafe Tatties. During my university days this and the other branch on Sussex Street were favourite student haunts for a cheap and cheerful jacket potato lunch (providing enough carbs to see us through a good few hours of studying, drinking and sporting) or, of course, a hearty no-frills fry up at the weekend. In its new form, the small restaurant spanning ground floor and basement retains the same simplicity and friendly character but has been smartened up considerably. 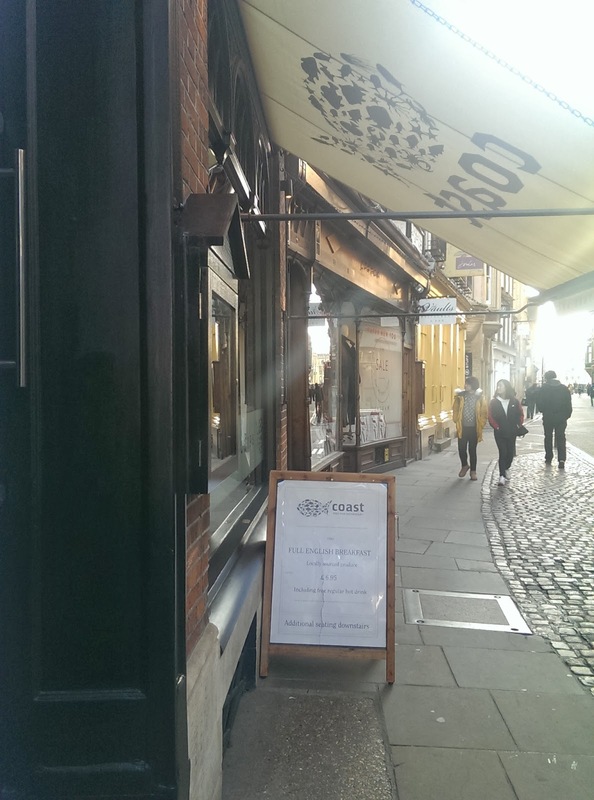 Coast is no chippy but a neat, contemporary dining space with light wooden tables and benches, exposed brickwork, subtle displays of Cambridge memorabilia, and an enviable outlook onto the cobbled streets of the historic city. Coast serves breakfast from 9am until midday on Saturday and Sunday. The menu is vast, an equal split between classic breakfast dishes such as a full English (plus veggie alternative), sausage sandwich (again with a veggie alternative), and eggs Benedict, and fish options like the smoked haddock souffle, smoked salmon and scrambled eggs, and Coast's signature breakfast of smoked and cured fish with poached egg. Curious additions such as the seafood croissant, salmon roll (featuring puff pastry and served with a poached egg), and countless possible omelette combinations were slightly confusing. The menu's central offering, the various fish dishes, excluded any mention of provenance, the absence made even more notable by the recurring focus on the locally sourced Cambridge sausage. We were disappointed to find no kippers on the menu and our first choice from the menu's fishy options, the smoked haddock souffle, wasn't available on the day we visited so we opted for a classic full English and the mammoth fish selection of the Coast signature breakfast. 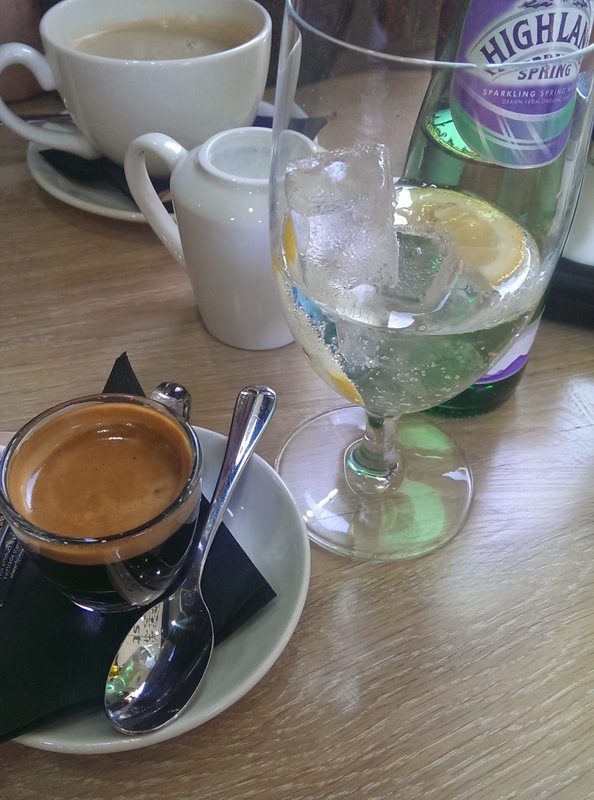 While we waited for our food, sipping pretty average Italian coffees (sad face) and Highland Spring sparkling water, the restaurant quickly filled. We liked keeping an eye on the open kitchen, a hive of activity set up behind a long wooden counter at the back of the restaurant, which added to the atmosphere without being too intrusive (rather like the friendly waiting staff buzzing around efficiently between the small tables). We noted some other positive points, like the cute caddies holding a selection of condiments from independent Suffolk brand, Stokes Sauces, and the delicious aromas of freshly cooked fish and chips arriving at the neighbouring tables. Huge plates arrived at our own table; the full English was a decent and filling rendition of the classic and great value at £6.95 for free range eggs, local sausages, bacon, grilled tomatoes, mushrooms, beans, toast, and a large potato rosti. The only thing missing was the black pudding (and, unfortunately, a photo!). Across the table, the signature breakfast was more of a platter than a plate and took us by surprise. 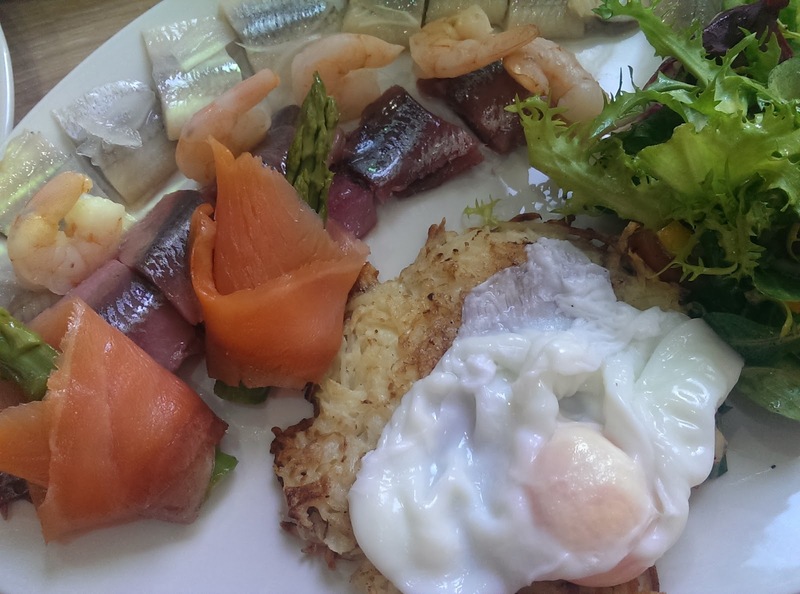 The menu promised smoked haddock, smoked salmon and cured herring, alongside poached eggs, potato rosti and salad. The fish selection that arrived, however, was largely made up of two types of very strong flavoured cured herring, a small amount of tasteless smoked salmon (bizarrely wrapped around soggy asparagus spears), some questionable prawns, and no smoked haddock. I'm a big fan of rollmops but there's only so many you can munch through in one sitting. For breakfast. The potato rosti and poached egg were to be the plate's saving grace, or so I thought; in reality the rosti was undercooked and not crisp enough to cut through the sharp oily fish and the runny yolk of the eggs therefore added to the richness rather than complementing the bold combinations. Overall a poor choice and definitely not worth the £8.95 price tag. Our verdict: Coast seems to be one for the tourists and the breakfast menu needs some work; some kind of fresh fish offering, done well, would be worth returning for. Top marks for the locally sourced full English ingredients and for giving thought to the condiments. When to go: For a generous and tasty full English. 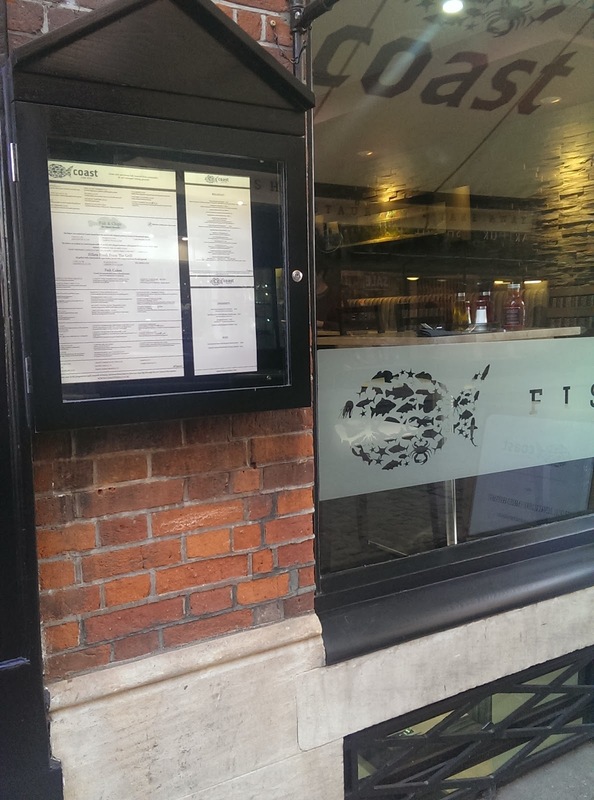 If it is fish you're after, we'd recommend waiting until midday and going for the well-priced fish and chips instead (available as an inexpensive takeaway lunch on weekdays to eat on the wall at King's, too). You might also like Côte Cambridge.